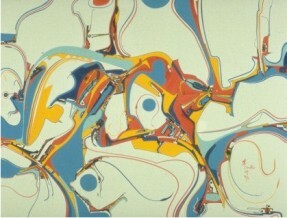 Native artist Alex Janvier was a founding member of the Professional National Indian Artists Incorporation, an association that in 1973 was created in Winnipeg to promote native art in Canada. There were seven founding members and Gary Scherbain, at the time a reporter at the Winnipeg Free Press, referred to the organization as the Indian Group of Seven...a name that has been getting more traction now that I've been publicizing it far and wide. Janvier was born in 1935 to one of the last hereditary chiefs of the Dene on Le Goff Reserve in Alberta. His mother was Saulteaux (Ojibwa). When he was eight he was removed from his family and sent to the Blue Quills Indian Residential School near St. Paul Alberta. It wasn't an entirely negative experience because at the school he was encouraged to explore his talent for painting. After highschool he entered the Alberta College of Art in Calgary and graduated four years later. This was as exceptional accomplishment for a First Nations man of his generation. He went on to instruct for a time at the University of Alberta's Department of Education. Janvier's style is generally linear, abstract and non-representational. The image above, available at the Red Kettle Gallery, was an earlier work.